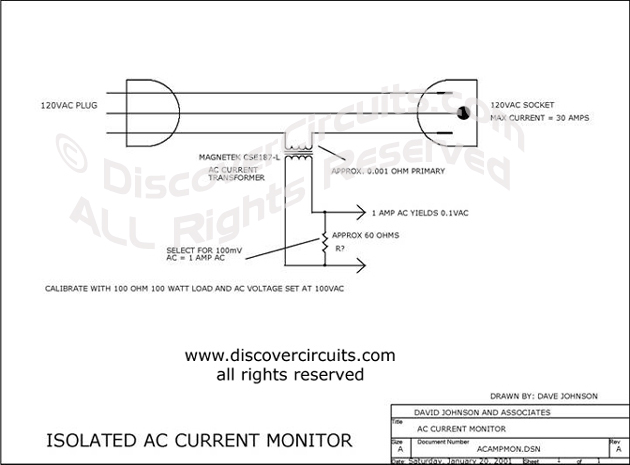 Circuit-ISOLATED AC CURRENT MONITOR __ Circuit designed by David A. Johnson, P.E. The hobby circuit below shows how a small current transformer from Magnetek can be used to monitor AC current to a load. The AC voltage developed at the secondary of the transformer can be scaled so it can be read by any digital multimeter. The transformer is rated at 30 Amps.